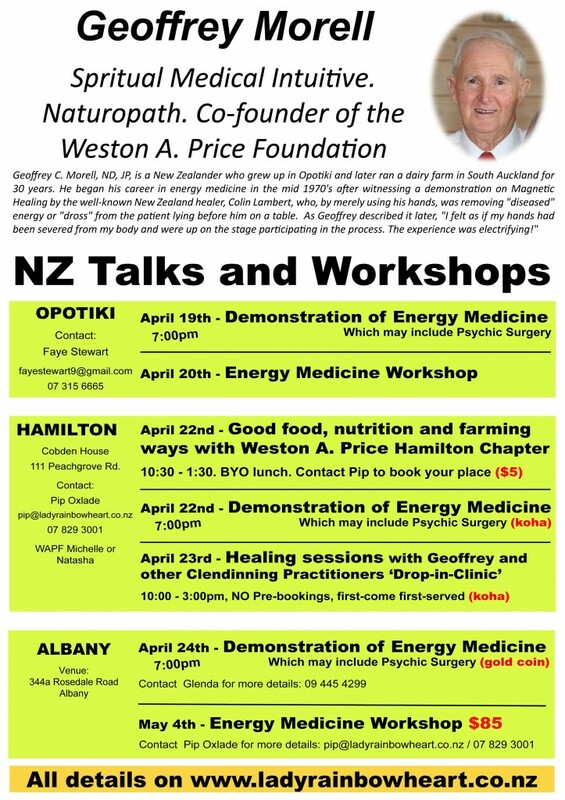 Geoffrey Morrel, ND, JD is currently in NZ to present workshops on both spiritual healing and also on the benefits of a natural foods diet, in conjunction with the Weston A Price Foundation. After testing out this newly found power on a number of people and seeing that he was having some effect, he spent several years learning about energy healing from a series of spirit guides during repeated meditation sessions. Geoffrey then devoted himself full-time to this field and developed his own method which he calls the Clendinning Technique. His hands are his tools as he passes them over the subject’s body, be it human or animal or even a photograph. Aside from running his private practice in Washington D.C., U.S.A, Geoffrey has also held demonstrations and given lectures at exhibitions worldwide in order to share his knowledge, as he believes everyone can do such work if their hearts are willing, even though their methods will vary.